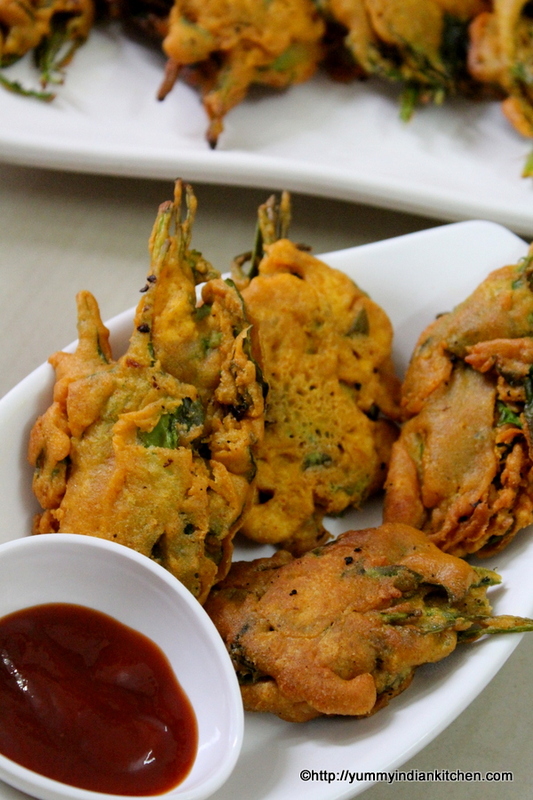 Spinach Fritters Recipe is another version of palak pakoda where the whole leaf is dipped into the batter and deep fried to make these spinach fritters…. 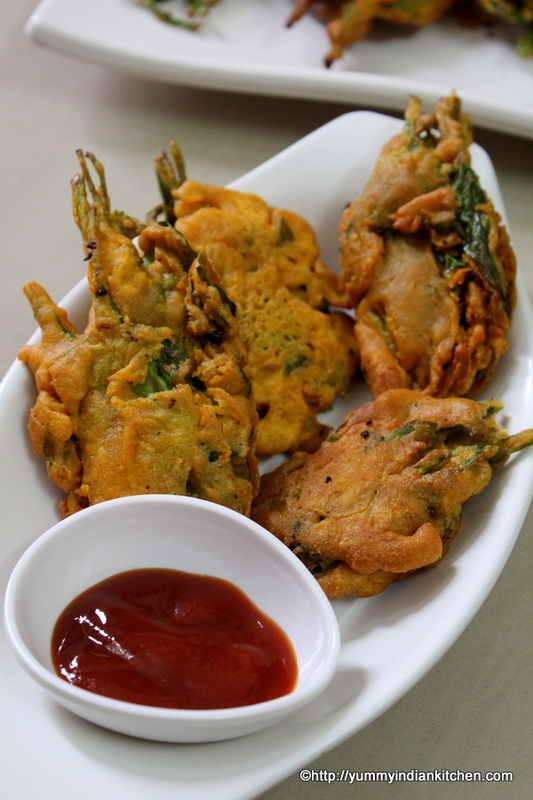 In another version of palak pakoda I have used finely chopped palak/spinach and sliced onions and these are totally different as I would be using whole spinach leaf to make the fritters. 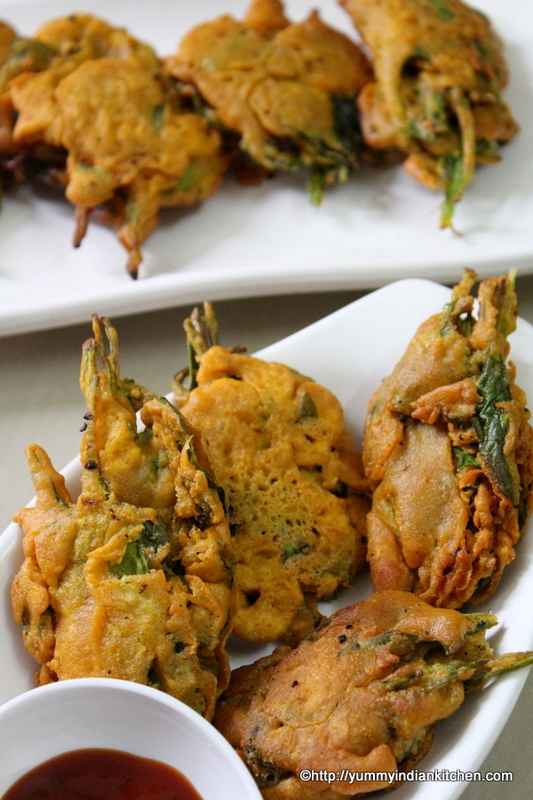 These deep fried bhajiya too are an amazing snack which are similar to palak pakora but here, I have made use of spinach leaf to make the pakodas and the batter which I have used to make them is plain besan batter without adding onions into it. This recipe too is perfect for rainy and winters and it is also usually made during the month of ramazan as an iftar snack recipe.. In a bowl, add the chick pea flour. Add rice flour, baking soda and mix well. Add salt as per taste, red chilli powder, turmeric powder, roasted coriander seeds powder, carom seeds and mix. Add ginger garlic paste, oil, coriander leaves and mix. Add water gradually and make a batter without any lumps. The batter consistency should neither be too thick nor too thin. 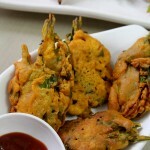 Take 2-3 leaves, arrange the leaves properly, hold the stalk with fingers and dip the palak leaves into the batter. Drop the dipped palak leaves into the oil. Deep fry them until golden on all sides on low flame. Serve hot with ketchup and tea!! !